Computed Tomography (CT), also known as CAT scan, is used for the evaluation of a wide range of symptoms and diseases. The patient lies on a moving table while cross sectional images are created by an x-ray tube spiraling at high speed around the body. Some exams may require oral contrast or the injection of a CT contrast dye. The CT images are generated after computer processing then sent to the Radiologist for interpretation. 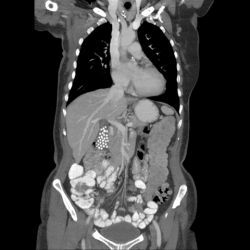 Some of the newest CT applications include CT colonography to screen for colon cancer, coronary artery calcium scoring to determine heart attack risk factors, and CT coronary angiography to look at the blood vessels supplying the heart.